(Late Period, after 600 BC. "Hildesheim Museum"
Preservation of human bodies after death is usually designated by two expressions, namely, "embalming" and "mummification". To embalm literally means "to place in balsam or resin". which is actually one of the last steps of the whole process of the preservation of the body. The word "mummification" is derived from the Latin word (perhaps of Persian origin) "mumia" which was mentioned by Dioscorides (first century A.D.) as a black bitumen found oozing from the earth in certain places. This word was applied at a late date to the embalmed bodies in Egypt, probably due to the fact that from the Twenty-sixth Dynasty onwards, bituminous materials were largely used in the presevation of the body. Mummification is undoubtedly the most distinctive technique or art which developed in Ancient Egypt. It greatly affected the habits and customs of the ancient Egyptians and, through it, much knowledge was gained in anatomy, chemistry, and many arts and industries. of Amon, shows her seated before a table of offerings. Mummification symbolizes the fear the ancient Egyptians had of death and answers their eager desire for immoratality. "In no country of the earth is life more attractive, more desirable (than it was in ancient Egypt)�.Little wonder that the Egyptians conceived a fanatical abhorence of death, and devoted no small part of their wealth to devising means of defeating it'' . This fundamental trait of the ancient Egyptians' psychology is quite apparent in the appeals of the dead inscribed on numerous Middle Kingdom funerary stelae, asking the passers-by to utter a prayer, behalf of the deceased. which is as follows: " O ye who live and exist, who like life and hate death, whosoever shall pass by this tomb, as ye love life and hate death so ye offer to me what is in your hands'' (Lange and Schafer 1902, p. 3). With an attitude such as this, the ancient Egyptians were ready to accept any explanations. no matter how contradictory, and to resort to any practices, no matter how peculiar, so long as they might be allowed to cherish their ideal tranquility (Davies and Gardiner 1915). Their imagination, accordingly, led the to believe that death does not necessarily terminate life, but that it merely means the dissociation of human life, where the spirit (incorporeal principle) abandon the body (Drioton 1945) as can be concluded from the Pyramid Text: "The spirit is for the Heavens, (but) the corpse is for the earth.'' One's incorporeal principle was believed to include his immortal spiritual forces which are composed of the Ka, the ba. and the akh. The ka, now generally believed to represent the ensemble of a person's qualities or characteristics, was most probably consider a kind of protective genius which is born with the child, remains with him as his double during his life to protect him, and after death resides in the tomb and neighborhood. The ba, or animating force, corresponds in some respects to what we call the soul. It is most probably the soul which takes a place in the bark of the sun, traveling in it around the underworld until, at the moment when the eastern horizon had been cleared at daybreak, it would leave the bark to return to the tomb to visit the mummy (Drioton. in Engelbach 1961). That is why the ba, represented as a bird with a human head, is generally figured over the mummy visiting it (fig. 1). Wooden figure of the mummy of Tutankhamoun reclining on a bier. If this analysis is correct, it follows that the soul�the ka and the ba (during day journey)�continued to live in the neighborhood of the body. ''Since, however, the matter-of-fact mind of the Egyptian could not, or did not like to, think of disembodied ghost, it was felt that the spirit still required a visible and tangible form in which to dwell. This form was preferably the body itself (Hayes 1953). The soul depended on the body and was fed by what the living brought and offered it. This idea inspired most of the practices of the cult of the dead in Egypt since the earliest times. It is the basis for the care which was taken to protect the corpse the deceased from disintegration brought on by natural decay. Hence, the ancient Egyptians developed the process of mummification to keep the body in a good state and to preserve its physical features so that the soul might identify it, for the destruction of the body would have meant also the decay of the soul. To protect the mummy it was encased in a series of coffins enclosed in a huge stone sarcophagus and buried in a tomb surrounded by its furniture and provisions. Thus, in the case of Tutankhamon. 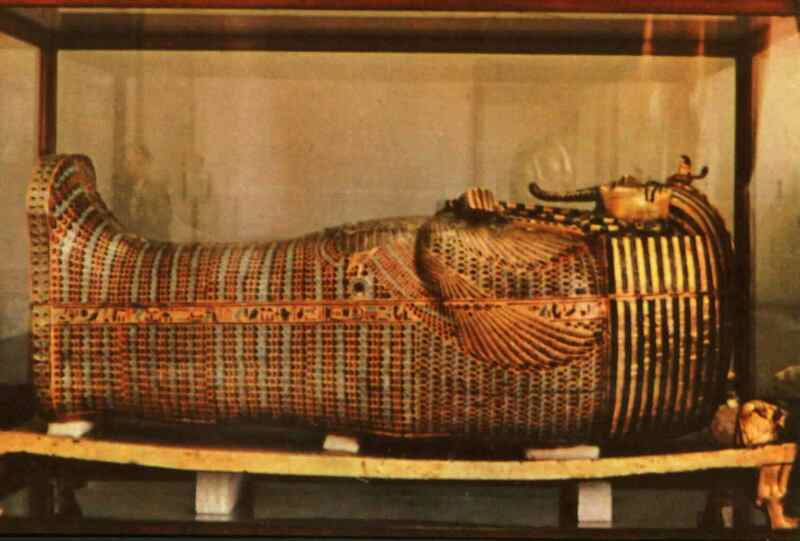 the mummy was encased in a gold coffin (fig. 2) which was enclosed in two other coffins (figs..3 and 4) and a huge quartzite sarcophagus which was in turn enclosed in four gilt shrines placed one within the other. 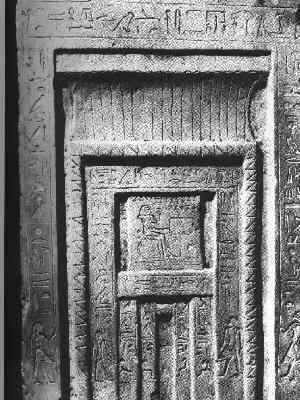 The tomb was furnished with a cult chapel, in which the soul, having access to the "false door'' (fig. 5), could enjoy the fresh offerings brought to it. The examination of these bodies proved that they had not been treated with any preservative materials. They must have been naturally mummified, since if the body is buried in a shallow grave 'in porous sand situated well above the maximum subsoil water level, the sand becomes intensely hot in the sun, and the body moisture slowly evaporates and escapes through the sand, and eventually the body is left dry, practically sterile, and in such a condition that it will last almost indefinitely if kept dry. Most probably this natural preservation of the body was noticed by the protodynastic people, perhaps when they were burying a new corpse in the sand near a previously buried one, and it might have inspired them to believe that the body could be preserved and could more or less retain its human likeness. Their trials started in the archaic period (First and Second Dynasties) by bandaging the bodies in close-fitting linen wrappings which in some instances eventually became elaborated into separate bandaging of each limb, with further wrappings for the whole body. Moreover, the body was in most cases enclosed in a wooden coffin, and later also in a stone sarcophagus for more protection. Many examples of such burials are known from the First, Second, (Quibell 1923, pp. 11. 19. 28. 32, and pl. xxix) and Third Dynasties, before the first effective processes of mummification were introduced. By the beginning of the Third Dynasty, if not earlier, ''accidental exhumation of earlier burials must have convinced the priests and physicians that neither coffins nor wrappings were sufficient to achieve'' what they had aimed at: pre serving the body in recognizable human form (Engelbach and Derry 1942). They realized that what were thought to be additional means of protection did not fulfill their expectation, and that the body decomposed completely and left nothing but bones. So they had recourse to removing the most decomposable parts of the body through an opening in the abdominal wall, and after a preliminary cleansing, filling the body cavity with linen, and finally representing the face and genital organs in linen, to restore the features of the dead man as he had been in life, so that his soul might be able to identify him as previously mentioned. The remains of King Djoser' s body, which were found in his granite burial chamber in the Step Pyramid at Saqqara, illustrate the first trials of such a technique, as will be mentioned later. Another item of archaeological evidence for the practice of mummification during the Third Dynasty is the finding of two pairs of long rectangular alabaster sarcophagi dating from the Third Dynasty at Dahshur (De Morgan 1875) (Cairo Museum Guide no. 30) and Saqqara (Lauer 1933) respectively. One of the sarcophagi of the first pair contains four alabaster jars which were most probably canopic jars for keeping the viscera of the dead body, while one of the sarcophagi of the second pair contained remains of a six-ply wood coffin which enclosed the body of a child of about ten years old. The comparison of the two pairs of sarcophagi and their contents showed that one of the sarcophagi of each pair contained the eviscerated mummy, while the other sarcophagus contained the four canopic jars which enclosed the different parts of the viscera. This evisceration of the body is a strong indication that mummification was undertaken. Besides, the fact that the two bodies were not buried in the contracted position which was the common habit followed in the predynastic period and the first two dynasties, but buried in two sarcophagi long enough to hold them in the extended position, is another evidence for the practice of mummification of the royal bodies in the Third Dynasty since, as Reisner expressed it, ''The moment any sort of mummification was undertaken, the body had to be kept in a more or less extended position to give access to the abdominal region'' (Reisner 1932, p. 13). From the beginning of the Fourth Dynasty we have found the alabaster canopic chest of Queen Hetepheres (Cairo Museum Guide no. 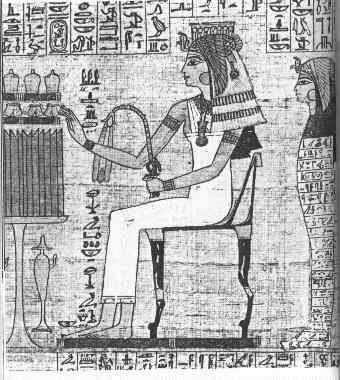 6047), wife of King Snefru the founder of the Fourth Dynasty, and the mother of King Khufu, the builder of the Great Pyramid at Giza, which contained packets of her viscera wrapped in linen, immersed in 3% natron solution (Reisner 1928). This proves that the body of Hetepheres had been mummified, although the alabaster sarcophagus which should have contained it was found empty, most probably because the body had been taken out by the tomb robbers for the sake of the jewelry which adorned it. Other mummies of the Fifth and Sixth Dynasties have been discovered, and from that time onwards mummification continued to be practiced until the early Coptic period. For long after its introduction, however, it was restricted to the kings and the members of the royal family: then it passed gradually to nobles, priests, and high officials, and it was not until much later that mummification became general and the poorer classes were also mummified. Since the ancient Egyptian texts give only very little information concerning mummification (Smith and Dawson 1924), and that mostly from the religious point of view rather than that of techniques, we have to rely largely upon the testimony of the classical writers. The most important of these are the descriptions given by Herodotus (fifth century B.C.) and Diodorus Siculus (first century B.C. ), though allusions to embalming occur in the works of some other classical authors (Smith and Dawson 1924). There are a set of men who practice that art and make it their business. These persons, when a body is brought to them. show the bearers wooden models of Corpses painted so as to resemble nature. The most perfect they say to be after the manner of Him who I do not think it religious to name in connection with such a matter: they then show the second kind, which is inferior to the first and less costly: then the third which is the cheapest. All this the embalmers explain, and then ask in which way it is wished that the corpse should be prepared. The bearers having agreed on the price, take their departure. The embalmers remain in their workshops, and this is their procedure for the most perfect embalming. First, by means of an iron hook, they draw out the brain through the nostrils! taking it partly in this manner, partly by the infusion of drugs. Then with a sharp Ethiopian stone they make a cut along the flank and take out the whole contents of the abdomen, which they then cleanse, rinse with palm-wine and rinse again with powdered aromatics. Then, having filled the belly with pure myrrh powder, and cassia and every other kind of spicery except frankincense, they sew it up again. Having done this, they ''cure' ' the body, leaving it covered with natron for seventy days; it is forbidden to cure'' it for a longer space of time. At the expiration of the seventy days, they wash the corpse and wrap the whole body in bandages of linen cloth, smeared over with gum, which the Egyptians commonly use in place of glue. After this the relations, having taken the body back again, have a wooden case made in the shape of a man and when it is ready, enclose the body in it. Then they fasten the case and store it thus in a sepulchral chamber, upright against one of the walls. Such is the most costly way of preparing the corpse. When the middle style is chosen and great expense is to be avoided, they prepare the corpse in the following manner. They charge their syringes with oil made from cedar and fill with it the abdomen of the corpse, without making an incision or taking out the bowels; they inject the oil at the fundament and having prevented the injection from escaping, they ''cure' the body for the prescribed number of days, and on the last day they let out from the abdomen the oil of cedar they had previously injected, such is the power of the oil that it brings with it the bowels and internal organs in a state of dissolution. The natron dissolves the flesh, and nothing remains of the body but the skin and the bones. Having done this, they return the body without further operation. The third method of embalming is the following, which is practiced in the case of the poorer classes; after clearing the abdomen with a purgative, they ''cure" the body for the seventy days and deliver it to be carried away (Engel bach and Derry 1942, pp. 236-38). When a person amongst them dies, all his relatives and friends, putting mud upon their heads, go about the town lamenting, until the time of burying the body. In the meantime they abstain from bathing and from wine and all kinds of delicacies, neither do they wear fine apparel. They have three manners of burial: one very costly, one medium and one modest. Upon the first a talent silver is spent, upon the second twenty minae, but in the third there is very little cost. Those who attend to the bodies have learned their art from their forefathers. These, carrying to the household of the deceased illustrations of the costs of burial of each kind, ask them in which manner they desire the body to be treated. When all is agreed upon, and the corpse is handed over, they (sc. the relatives) deliver the body to those who are appointed to deal with it in the accustomed manner. The examination of the mummies which were discovered in many sites of Egypt has yielded further knowledge concerning the techniques of mummification through all the history of ancient Egypt. The data obtained show that the method described by Herodotus and Diodorus agrees more with that used during the New Kingdom and the Late Egyptian Period, but it differs slightly in its details from that used in the Old and Middle Kingdoms. In all the techniques used, the main principle was the dehydration of the body so that the anaerobic bacteria could not live on its tissues and cause their putrefaction and decay. The method of mummification, however, varied from period to period, and even in the same period, according to the social status of the dead person. There are even slight or minor variations in the technique for the same social status in the same period. Hence there are no two mummies which are exactly the same in all details. A belief commonly held in ancient Egypt was that a spirit called the ba left the body after death in the form of a human-headed bird but at night returned to the mummy. 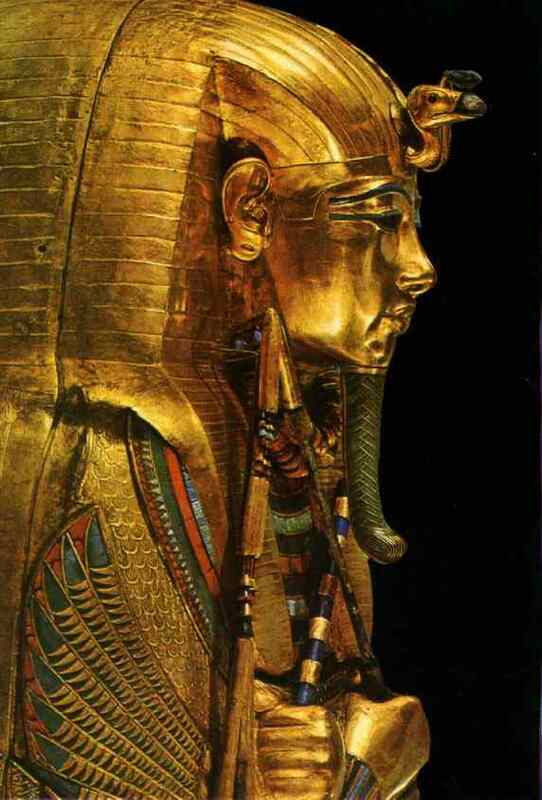 Another spirit, the ka, remained with the mummy. The elaborate mummification procedures and the abundant funerary equipment found in the tombs were essential for the well-being of these spirits. 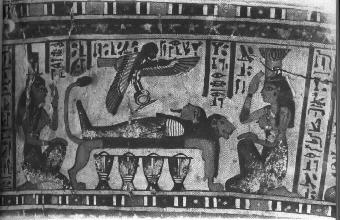 A painting from the Late Dynastic Period shows the winged ba hovering over the mummy of Harsiesi. First Prophet of Horus at Edfou (courtesy of the Egyptian Museum, Cairo).